My running shoes will take several more days to dry out after being saturated in Tuesday’s storm. Hence the walking boots were called into action for the second time in a week for a wander along a somewhat chilly Azaibah beach. 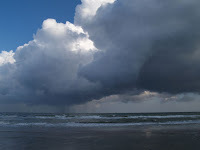 Storm clouds sat menacingly over the sea which frothed angrily over bands of blue, green and brown water. The fishing boats are still resting high on the beach having been out of action for many weeks, their engines wrapped in thick blankets and tied with rope to keep out sand. Although a few boats have been cheered up with Omani flags for the Gulf Cup, it’s a rather dismal sight. On the bright side, Oman beat Qatar last night to qualify for the final on Saturday. Just stay off the roads if they win.